Center Ty Darlington has earned a spot on the Capital One Academic All-America First Team as selected by the College Sports Information Directors of America (CoSIDA) Thursday. Darlington follows in the footsteps of his predecessor, center Gabe Ikard, who was a three-time Academic All-America honoree. 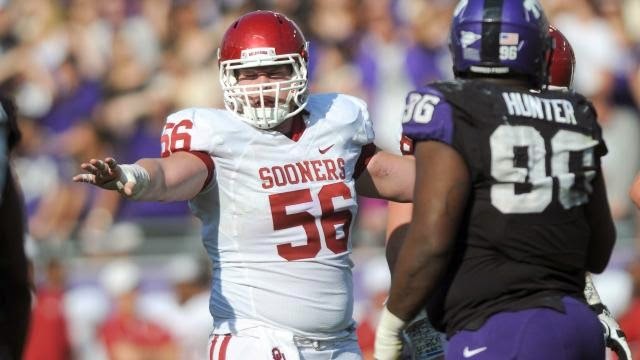 Ikard also became the first member of the Sooners’ football squad to be named Academic All-America of the Year in 2013. The 2014 season marks the fifth consecutive year that Oklahoma Football has boasted an Academic All-America selection. Darlington is part of an Oklahoma offensive line that has permitted a mere 6.0 sacks this season, the lowest total of any FBS program. The Sooners currently rank 10th in the country in rushing, averaging 265.4 yards per game thanks to the OU offensive front and freshman running back Samaje Perine, who set the FBS single-game rushing record with 427 yards vs. Kansas on Nov. 22. A native of Apopka, Fla., Darlington will be receiving his undergraduate degree from OU’s College of Arts and Sciences next week, a remarkable feat considering that he completed all of his requirements in only two-and-half years. He holds a 3.96 GPA and will serve as a commencement speaker at the College’s convocation ceremony on Dec. 12. He will begin pursuing his graduate degree in adult and higher education in 2015 with a career aspiration of serving as a collegiate coach or athletics administrator. To be eligible for Academic All-America consideration a student-athlete must be a varsity starter or key reserve, maintain a cumulative G.P.A. of 3.30 on a scale of 4.00, have reached sophomore athletic and academic standings at his/her current institution and be nominated by his/her sports information director.